As discussed, a gem's type, weight, size, clarity, and manner of contact are among the pertinent factors that affect its ability to mitigate or nullify negative planetary influences. The main consideration for the customer will of course be price. Over the years I have been trying to offer effective astrological gems for the lowest possible price so that even the small budget can afford the "luxury" of utilizing this blessed system of karmic mitigation. I am happy to report that great success has been attained often by unconventional means. The hessonite garnet provides an excellent example of the controversy surrounding gem costs and demonstrates how I have been able to keep the cost of navaratnas so manageable. The common hessonite is a roiled (heat waved), dark brandy-colored gem that retails for about $35 a carat. It is the easiest to procure, but seems to have little or no karmic mitigating effects (a recurring observation from my clients). Golden Hessonite, recommended by some very respected Vedic astrologers, is a clear and beautiful stone when not included. This stone, however, is not referred to in the Vedas, as it only began to appear on the market about twenty years ago, having been mined in Sri Lanka and Canada. I believe its similar atomic matrix must be advantageous but when the hessonite is referred to as cinnamon stone in the Vedas, that can only mean one limited range of color. Of the cinnamon stones, the highest-quality hessonite that is not roiled or included, over two carats is rare and costs over $85 a carat. Often it is confused with Almandine (Almandite), Malaia, Spessartite garnets or Brandy topaz (Madeira) and stained quartz. Though a few astrologers may advise substitutes, my studies advise this as a last resort. Because volume, clarity, and color are the main factors of potency, (as most scholars of Vedic prescriptions believe), I make available high-quality, deep cinnamon colored hessonite for about $10 a carat. The reason for its relative inexpensiveness is its shape. These gems are polished and smooth-edged specimens that do not have the correct dimensions for large-stone conventional faceting. Therefore, they are not as marketable. 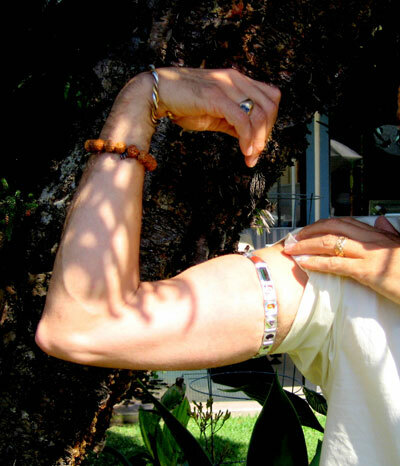 They do however have excellent astrological strength. I am extremely happy to have located this supply after three years of searching. It is this type of patience, commitment and expertise which allows me to develop financial savings resulting in relatively inexpensive gem bangles - of high quality - for my customers. Many people still believe that high-quality gems must cost a king's ransom. But in this age of dynamite, excavators, and mechanized mineral processing technology, what once came to rest with wealthy collectors is now much more affordable. Laboratories, using revolutionary techniques to copy Mother Nature's gem growing environment, have greatly expanded the supply of top quality gem material, and thereby reduced its cost. This gem is perhaps the most varied of all the primary Ayurvedic gems. Gemologically, there is more confusion concerning this garnet than any other. Traditionally, it used to be called cinnamon stone in India. There is a very large amount of it on the market that has a visible, roiled appearance, or extensive inclusions. It is one of the hardest to get inclusion-free with the correct color and sufficient weight. The crystal clear variety is the much more valuable. The roiled material sells for around $20 a carat and is not recommended. The well-cut, totally clear cinnamon brown ultra-clean material goes from $85 a carat up to $160 plus. The jump in price is based on rarity and demand for the much heavier, flawless stones. Astrologically, my research tends to advise the much less expensive, tumble polished material for the budget-conscious. These small, clear, pebble-like stones have the weight and color but not the cosmetic symmetry associated with cost, and sell from $8 to $16 per carat. Again, the price variation is dependent upon the size of the stone, a clean 6-carat, tumble polished hessonite would be $15 per carat. I also have golden hessonite that some customers request. This attractive gem sells from $35 up to $55 a carat. Flattened laboratory-grown ruby crystals which are clear, irregularly edged gems, perfect for bangle settings, normally sell for $25 per carat. Equal quality laboratory-grown ruby crystal, but faceted, will sell from $140 to $195 per carat depending upon depth of color and size. Good quality natural ruby can go from $550 per carat upwards. Depth of color, size, and clarity can multiply the price by five-fold very quickly. And even with gemological analysis laboratory reports, I am not always completely satisfied with declarations that the stones haven't been tampered with (super -fried ). Some of the crystal growing laboratories do just too good a job of growing the rubies for the gem testing labs to detect whether they are natural or not. Price depends on luster, shape, symmetry, and lack of nacre blemishes. 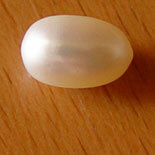 A smooth, undrilled, non-bleached, tissue grown, fresh water round pearl will sell by the piece from $75 up to $140. These are not the bead or seeded cultured variety. 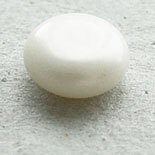 Other irregularly shaped large pearls will generally sell from $40 each and more. 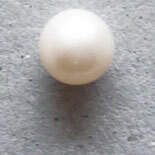 Naturally occurring salt water pearls are exceptionally rare and have to be special ordered from Australia and will sell from $700 upwards for one that is over five carats of high quality. Red coral - or rather orange red coral as it should be called, as this is the material most commonly used - is generally $20 dollars plus per carat for higher quality material. 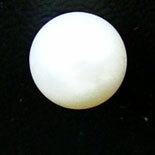 Large, round, undrilled beads (9mm) due to scarcity can skyrocket up to $80 per carat. Shape and size has a lot to do with rarity. Its not unusual to see a large bead (11 mm) red coral necklace sell for $35,000, though I have 80 carat large rice grain bead necklaces for $58. There is a tremendous amount of imitation material on the market including white coral and bone which is dyed red, ceramic and glass beads. In my experience, emerald is one of the most over valued gems on the market, one of the most misrepresented and fraudulently priced. I have little difficulty selling the laboratory-grown emerald crystal cut gem stones to clients when they see the crystals in the raw form and they compare the price against the heavily included and extremely expensive natural gem quality emerald which starts at $190 a carat. And the price keeps going up. Most clients settle for material priced around $650 a carat in the higher quality range. The lab-grown material, which has the perfect deep green color and is clear of cracks and foreign matter inclusions, sells from $55 up to $75 a carat and much less for non-symmetrical cuts. Please remember most emerald on the market is fracture filled with a plastic resin or green oil with the same refractive index. Blue sapphire doesn't seem to have a lot of price variety unless of course one compromises price by acquiring a heat-treated stone. These can sell from $70 a carat and up. The more expensive unheated blues will go from $190 a carat and up, depending on the intensity of the natural blue. $290 plus is common for a good blue. The intense, unheated or non-irradiated natural blue can go for over $900 a carat. Beware of the blue sapphires in the local jewelry store. Any honest Bangkok gem dealer will let you know that 97% of blue sapphires are generally heated to a little below melting point in order to deepen the color. For all my phone work, door knocking, faxing, and plane travel over the years, still the elusive price break on high quality, large diamonds hasn't occurred. I do not favor the Russian laboratory grown diamonds. They simply do not have all the characteristics the natural diamond has. It is astrologically important that the gem has no black carbon inclusions, and is very clean. I often purchase VVSI or IF diamonds in the light cape color range over two carts for around $3,000 per carat. I can explain the purchasing procedure over the phone to interested parties. I generally suggest to clients that unless Venus is seriously afflicted in their horoscopes, it is better to concentrate on acquiring the eight other stones in the best possible size and quality. They should wait to add a diamond until they have been wearing the other stones for awhile and can attest to their effectiveness. At the lower end of the price scale I sell high quality, uncut, natural, clean diamond crystals - when I can get them at the right price - for $350 per carat. Very pale yellows start from $90 a carat and work themselves up to $300 a carat for a good color, unheated stone. Most yellow sapphires on the market are heated and virtually all the golden sapphires are also. Heat treated yellows often color fade within a year or two. Some astrologers often advise golden topaz as a substitute not realizing that citrine is often sold by the same name. Here is another complexly priced stone with many variations.There are many different catseyes on the market. True chrysoberyl is among the most rare and expensive. There are opaque and transparent catseyes. Prices will travel between $90 a carat (which will not be totally flawless) up to $600 a carat or more.